This pressure relief vent is available in stainless steel. 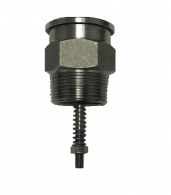 The release pressures are factory set to your requirements within pressure ranges of .5 through 10.0 psig. Additional pressure relief ranges are available upon request. A full range of seal materials are available to work with your chemical and environmental needs.